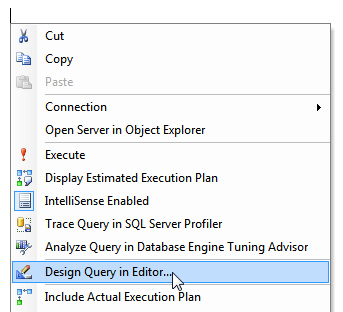 Create a new query ... ... then choose the current database. The query should show the 7 books with corresponding authors. Right-click in a new query and choose to design your query. Double-click on each table that you want to include in your query. SQL Server automatically creates a join between the two tables. 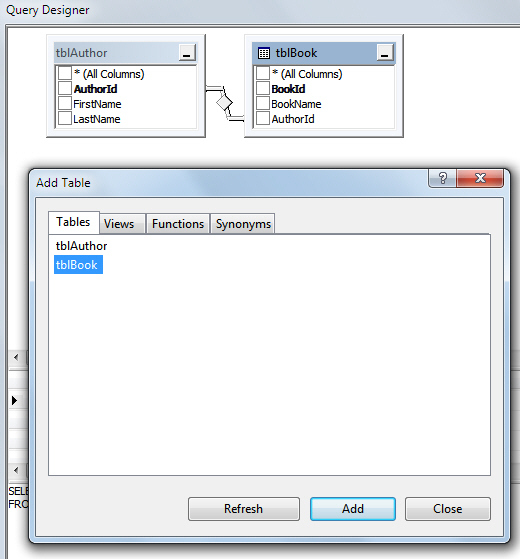 Management Studio puts this link in because each table has a column with the same name (AuthorId) and the same data type (bigint) with one of the two tables (tblAuthor) having this column as its primary key. Here we've chosen to include 3 columns, and we're about to sort the query by the LastName column. Once you've got the SQL (and join syntax) that you want, you can make it look neater. It won't affect the SQL, but it may make you feel better! The above SQL is exactly the same as the code generated, give or take a bit of indentation and a comment - but it's MUCH easier to read. This is all very well, but what happens if SSMS doesn't create a join for you? Suppose that the tables weren't joined automatically? 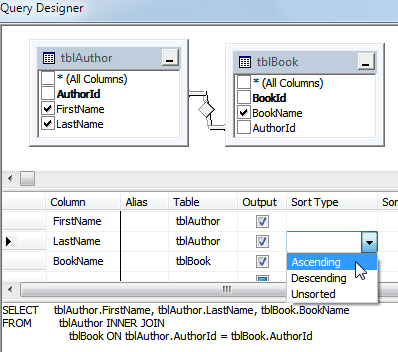 Drag the AuthorId column (1) onto column (2) in the tblBook table to create a join. Right-click on any join to see the options shown above (and explained below). What a left outer join looks like in query editor. However, we haven't yet seen what an inner join or outer join actually are, so it's time to step back a bit and have a look at how to create an inner join the hard way - by writing SQL.